The personal injury attorneys of Zinda Law Group have built an outstanding record of success by bringing extensive experience, thorough preparation, and aggressive representation to all our cases. We are proud of the verdicts and settlements that we have achieved for our deserving clients. The following is a sample of just some of the results our firm has helped obtain on behalf of our clients. A propane gas company did not properly install a propane tank which led to a leak and the eventual destruction of a home and the death of one family member and serious injury of several others. After litigation was commenced the propane company quickly agreed to the settlement demand made by Zinda Law Group. In a highly contentious case a gas distributor agreed to settle the claims of the estate of a woman who died in a gas explosion thanks to Jack Zinda and his team. A commercial vehicle operator was driving on a major interstate at approximately 75 miles per hour. Distracted by several devices, the driver slammed into the back of a vehicle that was stopped due to traffic. The impact killed the passengers and catastrophically injured another. The driver was not held accountable in criminal court, so the family hired Jack Zinda and the Zinda Law Group to ensure this did not happen again and the loss of their loved ones would not be in vain. Our firm immediately filed suit on the matter and aggressively pursued the case, and we were able to resolve the case within 10 months of the matter being filed. A large commercial truck ran a red light disregarding the safety of other drivers on the road. The truck slammed into another vehicle killing the passengers. The truck driver initially said that he did not run the red light. Through a thorough investigation it was established that the truck driver had indeed ran the red light leading to the deaths of the young men. 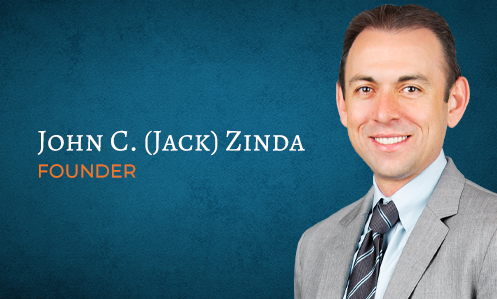 Jack Zinda successfully represented one of the passenger’s families and was able to hold the responsible truck driver and its company accountable. A hospital’s negligence led to the death of one of its patients. The hospital failed to take a simple precaution which if had been done would have prevented the patient’s death. Jack Zinda represented the family of the young man and held the hospital financially responsible for its actions.